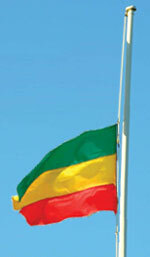 President Zuma today paid tribute to late Ethiopian leader Meles Zenawi who died at the age of 57. President Zuma called Meles Zenawi a "great leader" who had contributed much to Ethiopia and Africa as a whole. Was President Zuma talking about the same Meles Zenawi, the dictator of an impoverished 10th world nation with no viable economy, no modern infrastructure, rampant starvation, and whose citizens flood South Africa as "Economic Refugees". If he was, then Jacob Zuma either doesn't keep himself up to date on what is happening in the real world, or he is living in a dream. The people of Ethiopia starve while their deceased dictator gets lauded by the South African President! Is President Zuma blind? Or is this just black African culture at it's worse - honour the dead no matter how despicable a person they were when alive? 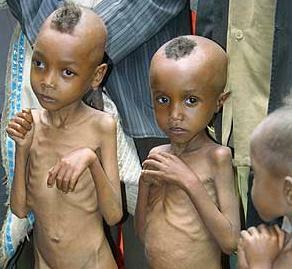 I wonder what these children feel about their dictator being called a "great leader who contributed so much". President Zuma is himself leader of what USED TO BE the ONLY successful nation on the African continent, which is rapidly failing. Youth unemployment in the president's own nation exceeds 70 percent, and total unemployment is over 48% (unofficial sources). This is the president of a nation whose infrastructure is failing apart... telecommunications has reached the crisis point, economic growth is effectively negative, although the powers that be manipulate figures to make it appear like a small growth. Raw sewage is flooding the rivers and the nation's water supply... Education, well, this is a nation that delivers school books 3 months before the scholastic year ends, and produces less than 1600 matriculants sufficiently schooled in mathematics to cope with first year university maths - out of nearly 1 million scholars in matric! So it's not surprising President Zuma thinks Ethiopia is a great success - it's an independent black African nation, what else matters.